If your parking lot is piled high with snow, entryways to your building are barricaded by “white stuff,” and walkways are slippery with ice, who’s going to brave the conditions to do business with you? Accessibility is crucial: Clear, safe pavement is non-negotiable for commercial and retail operators in northeast Ohio. In fact, snow and ice management services have a direct impact on your ability to generate revenue. If people can’t safely pull into your parking lot and walk into your entrance, you’re not in business that day. You might as well hang a closed sign on the door. Still, it’s easy to analyze your snow and ice management contract for your northeast Ohio commercial property and wonder, “Where are my dollars going?” What factors affect the pricing of this essential winter maintenance service? At Schill, we believe that explaining the “why” behind what’s in your contract is critical. It helps our clients better understand their spend. Empowering you with the pricing details makes you a better consumer, and it holds us accountable for our work. Taking responsibility across the board — for quality, pricing and our environmental footprint — is one of our core values. So, here are some of the key factors that affect the price of your snow and ice management contract. We’ll reveal the economic and environmental factors affecting pricing (“the situation”) and how we work (“the solution”) to steady prices in spite of the constant, aggressive inflation of materials pricing and overhead expenses required to perform high-quality snow removal in northeast Ohio. 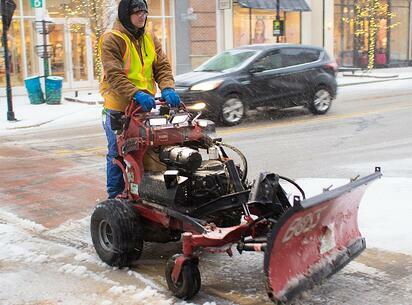 Want to learn more about managing snow and ice on your commercial property? It’s no secret that winter 2017 was one of the coldest and hardest on record in northeast Ohio, and all over the country. We faced significant salt shortages, which drove up demand and resulted in price spikes. We’re expecting up to 40-percent increases in salt prices for this year. Municipalities get priority for filling reserves, which puts additional supply pressure on snow and ice management firms like Schill. Salt became scarce toward the end of last winter and into early spring, when our region was still experiencing snow and severe below-freezing temperatures. Slip-and-fall liability was on the radar through April for commercial properties in our area—what a long winter! Meanwhile, from our clients’ financial standpoint, many of our commercial and retail clients might have blown through their 2018 snow and ice removal budgets because of the snow and ice we experienced well into spring. Fall 2018 will be here before you know it, and the question is: What are we going to do about the price of our snow and ice management contract? Mother Nature dumps on northeast Ohio and brings a winter to remember (or not), but the budget is what it is. We get it. There’s no editing the numbers based on what the Doppler radar is doing. 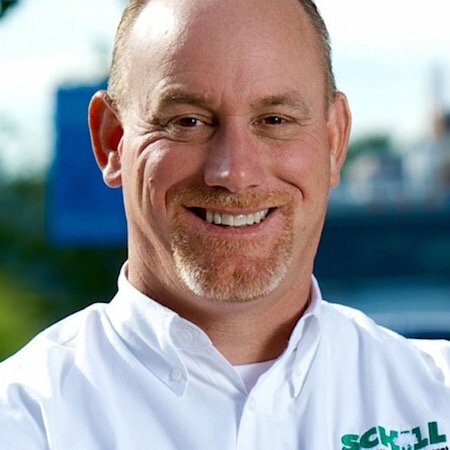 Schill has been successful at maintaining the pricing of its snow and ice management services for northeast Ohio clients because we’re progressive. We invest in research and experiment with alternative deicing formulas that deliver equal results as salt without stressing the supply (and clients’ budgets). We use stand-alone liquid deicing products and brines that can be used alone or mixed with bulk products (e.g., salt) to reduce the consumption of price sensitive material. Our liquid deicing products significantly reduce the amount of chemical de-icing products we apply, which gives clients a more sustainable and cost-effective solution. This way, treated road surfaces require fewer chemicals and applications throughout the season, saving both time and fuel. Prices at the pump continue to creep—or climb—depending on the day, and even the time of day. The reality is, fuel prices are not going to decrease, even if we experience a daylong dip. What’s important to know is, there’s a significant correlation between fuel prices and the cost of removing snow and deicing your northeast Ohio property. 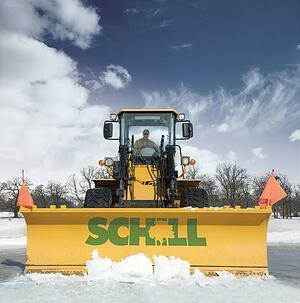 At Schill, we focus on complete efficiency when routing our snow and ice removal crews. Not a mile goes to waste, which maximizes our fuel spend so we can maintain stable prices for clients. Some landscape and snow removal firms in northeast Ohio add a fuel surcharge to contracts to help absorb the cost of fuel. We take a different approach. Instead, we focus on improving our internal operations so we can make the best use of fuel and keep our consumption level, or even decrease it. Safety is the No. 1 priority for our clients. They must maintain clear, wet (not icy) parking lots, driveways, sidewalks and walkways for their employees, tenants, guests and customers. The risk of slip-and-fall injuries and potential lawsuits could put them out of business. Snow and ice removal services are performed to maintain that safety, no matter the weather conditions in northeast Ohio. The last thing our clients are thinking about is the insurance we pay for safeguarding their properties. Our insurance premiums are indirectly impacted by other parts of the country where slip-and-fall litigation is more prevalent (or even rampant). We can’t control our insurance carriers’ pricing, and we also have no say in slip-and-fall litigation across the country. As a company that values personal responsibility—and responsibility, overall—we recognize that the only way to mitigate the insurance premiums we pay to operate our business is to focus diligently on safety. Our professional crews spend a great deal of time training to perform their jobs safely so we can mitigate risk for our clients. And, our fast response time during snow and ice events allows our northeast Ohio commercial and retail property owners to maintain safe properties and mitigate slip-and-fall liability. When a snow event happens, we’re there immediately to clear the way, and reduce risk for everyone involved. Following a rough winter, snow and ice management contractors are facing supply and demand stress, while clients are dealing with budget concerns. 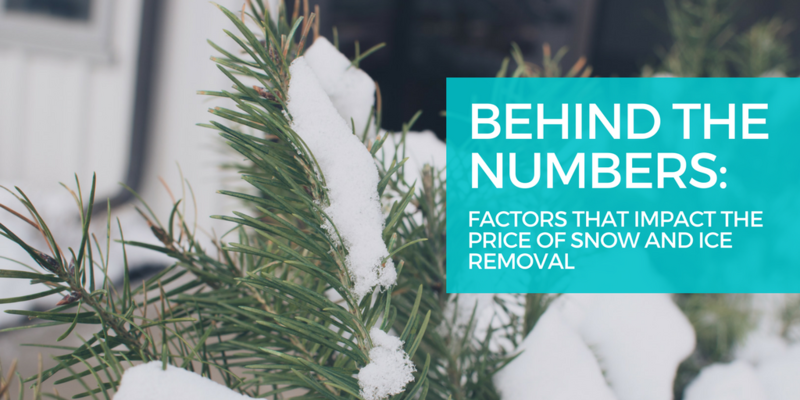 We think it helps to understand the numbers behind the bid, and we encourage you to call us any time to talk about how we do snow and ice removal differently and what that means for your bottom line. Even in the dog days of summer, it’s prime time for securing snow and ice removal services for this coming fall and winter. Give us a call any time at (440) 327-3030 — or fill out our simple contact form and we’ll get in touch with you!